The world of truck accessories is like a high-quality engine: it always seems to have another gear. Custom truck parts are constantly being refined and niche markets are coming to the mainstream. Gearheads are eating it up with a spoon, modifying their rides into their dream machines. 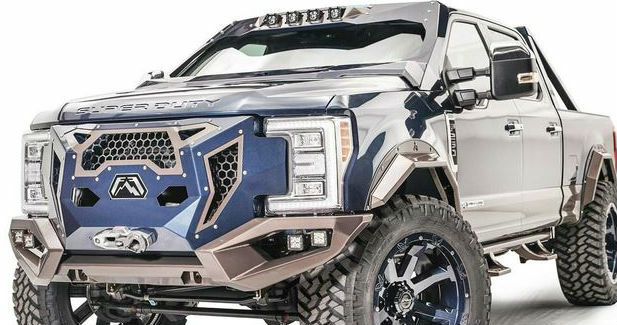 Truck and Jeep accessories are consistently pushing the limit in new custom parts. In this market, if you’re not at the front then you’re falling behind. Manufacturers such as Fab Fours, Go Rhino, Ranchhand and Roll-N-Lock are creating fresh designs to open the possibilities for unprecedented levels of customization. 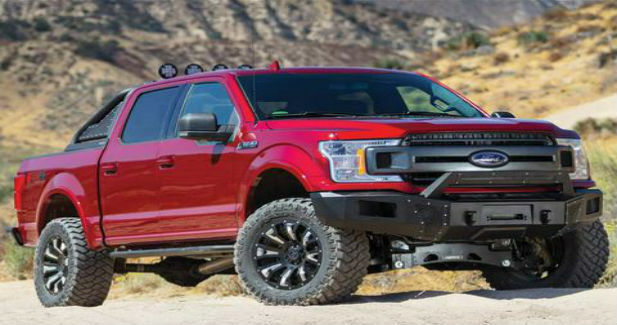 Fab Fours newest truck accessories the Grumper was named for more than just its powerful, aggressive styling. 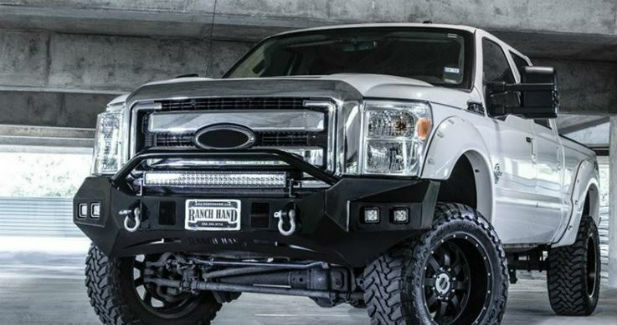 These extreme truck accessories are pushing the limits when it comes to custom truck parts. The custom bumper portion includes two great areas for LED fog or flood lights, also an enclosed fairline and winch, giving you the ability to get you and your friends out of trouble when you’re off-roading. Designed with that dark vader performance look in mind, the nerf bar setup also provides an absolute extreme look over stock parts. The cutouts increases airflow for smoother driving. The grille portion also has nine unique inserts so you can feature different colors. Also if your looking for one of a kind fender flares Fab Fours has got you covered on that to. The Fab Fours ViCowl helps you build a monster by combining a roof visor with a cowl. Not only does it make your machine look like a beast, it adds plenty of function as well. Your windshield is better protected from flying rocks and low branches as you rip over the trails. An optional light bar insert can help you see trouble before it’s too late. The installation is quick and easy, so even budding gearheads can get this custom piece on their rides. It also minimizes the amount of tinkering you do with the electricals by leaving the stock antenna in place. When are these new Fab Fours truck and Jeep accessories available? The Grumper and ViCowl are available now, having been released in January of 2018 just give us a call. These front and rear bumper replacements are wildly popular because they’re tough and add versatility to any truck. Precision measured with lasers, these Ranchhand & Go Rhino bumpers provide a custom flair that doesn’t look like it was added in shop class. The textured, black powdercoating protects the metal and matches any style you’ve created for your pickup. Made to work with all off-road truck accessories, this bumper accommodates winches rated up to 12,500 lbs. Optional light mount plates and available light mount bars create a custom part that’s prepared to provide some serious illumination. The BR5.5 and BR10.5 models are taking truck accessories bumpers to the next level. Go Rhino went back to the drawing board and made it even easier to use winches. This started with an easy-access hinged cover. Go Rhino knows you don’t want to always deal with feeding a winch through a tiny slot. The integrated 2” hitch receiver can easily be hidden behind a removable cover. Go Rhino’s patented heavy-duty d-ring shackle mounts are convenient and welded on for added stability. This new generation of bumpers isn’t a face lift; the added functional ability takes these replacements from cool to must have. Which tonneau cover is the best? It seems like a matter of opinion, but Roll-N-Lock may have earned the distinction with its new E-Series. 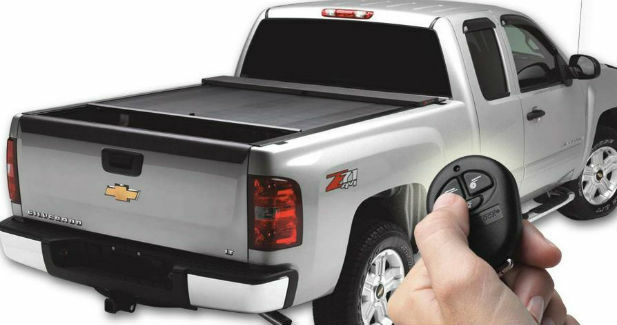 This truck accessories tonneau covers protect your gear from the elements and theft. A patent-pending system offers no seams for criminals to wedge open when they’re trying to steal your equipment. The powder-coated aluminum material laughs at blow that would destroy cheap plastic covers. Its biggest upgrade is the introduction of a control fob. This not only opens and closes the cover on command, it can lock it down anywhere along its length. That means no more awkwardly tying open covers with ropes or bungee cords when you’re hauling lengthy cargo. The pressure-sensitive cover even stops when it encounters resistance, so you don’t crush your valuables.